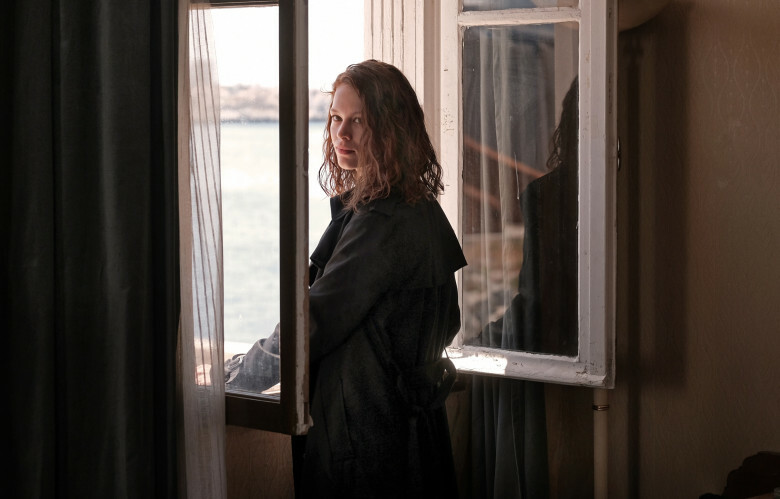 Based on a novel by Anna Seghers, whose original context for the story was Nazi-occupied France, Petzold makes a bold choice in assigning no definitive time period to the story…it could’ve been told then…it’s certainly potent now. Marseilles becomes a timeless purgatory (or is it hell?) where transient souls seek passage to their next port…the foghorns of ships signaling to all trapped there, “You could be next.” This surreal, often uncanny, take on the story allows Petzold to insert some Kafkaesque visuals where artistic images of ships sinking or being tossed about violent seas play on the big-screen in the waiting room of a consulate where people come every day to navigate the surging bureaucracy in hopes of getting their visas and transit papers. Meanwhile, dialogue pondering who is the first to forget, the one to leave or the one who was left behind, loops into the narrative as a taunt to all those who have been on both sides. In this hell, the refugees can still imagine, and maybe even briefly conjure, love, but it’s the oppressive feelings of shame, guilt, and longing…why didn’t we do more when they came for our neighbors…why didn’t we hold onto our loved ones just a little longer…why did we leave…why didn’t we go...that fuel their convoluted motives to wait…or go. My wife and I joked that you need multiple advanced degrees to unpack all the layers of a Petzold film, perhaps in comparative literature, history, and film. But Petzold’s studiousness doesn’t detract from enjoying his films, if anything, it makes them richer and harder to forget. We also cast an American remake. Joaquin Phoenix would play Georg. Brie Larsen could be Marie. Perhaps a Bradley Cooper as the doctor? And the setting would change to California…or Texas…somewhere at the Mexican border…or perhaps in a bolder, more romantic move Marseille could be replaced with New Orleans? My wife insisted Alfonso Cuaron direct, but I thought first of Alejandro Gonzalez Inarritu (whose Biutiful this film shares many layers and themes). And as great as those hypothetical remakes could actually be…they would probably pale in comparison to this. Transit is that good. This entry was posted in Art-house Cinema, Book to Film Adaptations, Movie Reviews, Movies, Psychology and tagged Anna Seghers, Christian Petzold, Fascism, Foreign Films, France, Franz Rogowski, German Films, Godeheard Giese, Hell, Marseilles, Neo-Noir, Paris, Paula Beer, Psychological Thrillers, Purgatory, Refugees, Transit.